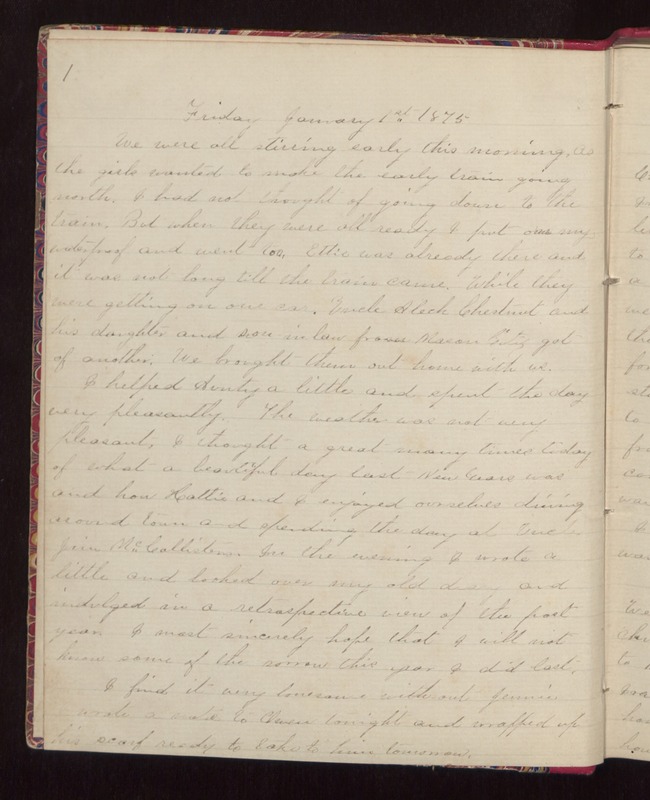 Friday January 1st 1875 We were all stirring early this morning, as the girls wanted to make the early train going north. I had not thought of going down to the train. But when they were all ready I put on my waterproof and went too, Ettie was already there and it was not long till the train came. While they were getting on our car, Uncle Aleck Chestnut and his daughter and son in law from Mason City got of another. We brought them out home with us. I helped Aunty a little and spent the day very pleasantly. The weather was not very pleasant, I thought a great many times today of what a beautiful day last New Years was and how Hattie and I enjoyed ourselves driving around town and spending the day at Uncle Jim McCollisters. In the evening I wrote a little and looked over my old diary and indulged in a retrospective view of the past year. I most sincerely hope that I will not know some of the sorrow this year I did last. I find it very lonesome without Jennie. I wrote a note to Owen tonight and wrapped up his scarf ready to take to him tomorrow.